Marcus "Koos" Hanel played eleven seasons in the Pirates, Braves and Diamondbacks organizations. Now in his thirteenth season as Milwaukee's bullpen catcher, he runs a charitable organization called Koos for Kids which focuses on helping terminally ill and disadvantaged children in Southeastern Wisconsin. He kindly answered my questions about baseball cards. "Favorite card of me is action card of me throwing! The posed ones are just cheesy! Unfortunately I never got into cards. Had a player in AA who was a little showy and flashy. When his card came out he happened to be standing in front of a hot dog billboard." Thanks! His AA teams were the 1995, 1996 and 1997 Carolina Mudcats, if anyone has those team sets. I have two cards of Johnny Ard. This one is from 1990 Bowman. 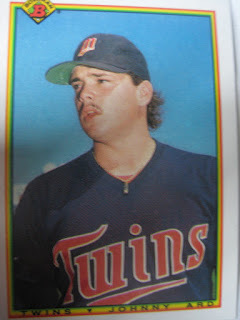 Playing Career: The Twins' first round draft pick in 1988, Johnny Ard went 32-16 in his first three years of professional baseball. 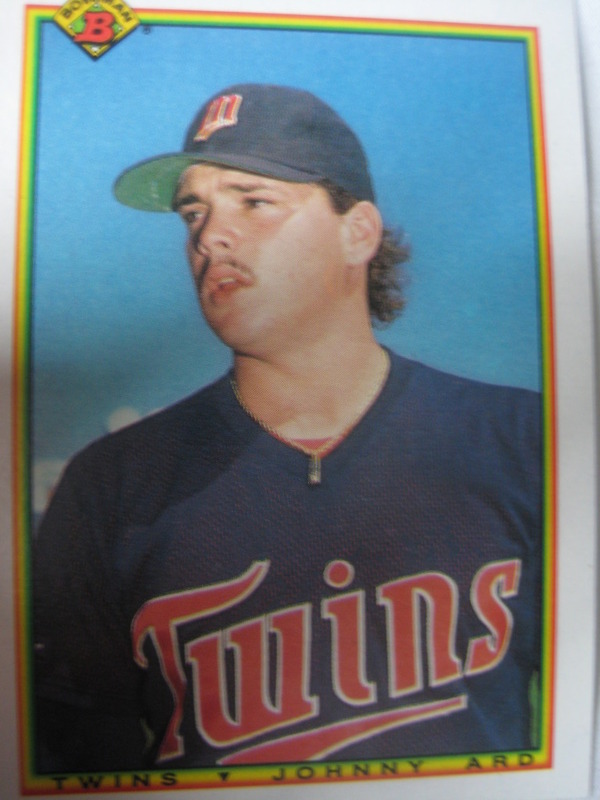 After the 1990 season he was traded to the Giants for Steve Bedrosian, got hurt, and never made the major leagues. You can read more about his playing career at The Greatest 21 Days, which has profiled him twice. My memories: I remember the name from the Bedrosian trade, that’s all. Where he is now: Coaches the 12-and-under Valdosta-Lowndes County Parks and Recreation Authority All-Stars in Georiga. Google Autocomplete Results: He is first when you type Johnny Ard, ahead of Johnny Argent, the boyfriend of Roseanne Barr. Another prominent Johnny Ard is an Army MP. Coming up next: The next profile will be J.P. Arencibia. 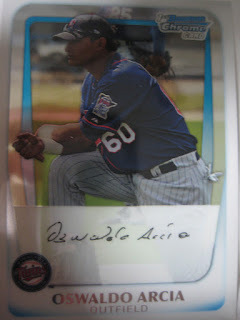 I have one card of Oswaldo Arcia, from 2011 Bowman Chrome Prospects. Playing career: Oswaldo Arcia signed with the Twins organization in 2009 and made a splash in 2010 hitting .375 with 19 HR and 51 RBI in 64 games in rookie ball. Where he is now: In 2011 he was slowed by injuries a bit, but hit .291 with 13 HR and 51 RBI in 81 games across three levels. Google Autocomplete results: He is fourth when you type Oswaldo, between Oswaldo Sanchez, a Mexican soccer player, and Oswaldo Cisneros, a Venezuelan billionaire. There do not appear to be any other prominent Oswaldo Arcias. Coming up next: The next profile will be Johnny Ard. I have one card of Kurt Archer, from 1991 Classic Best. 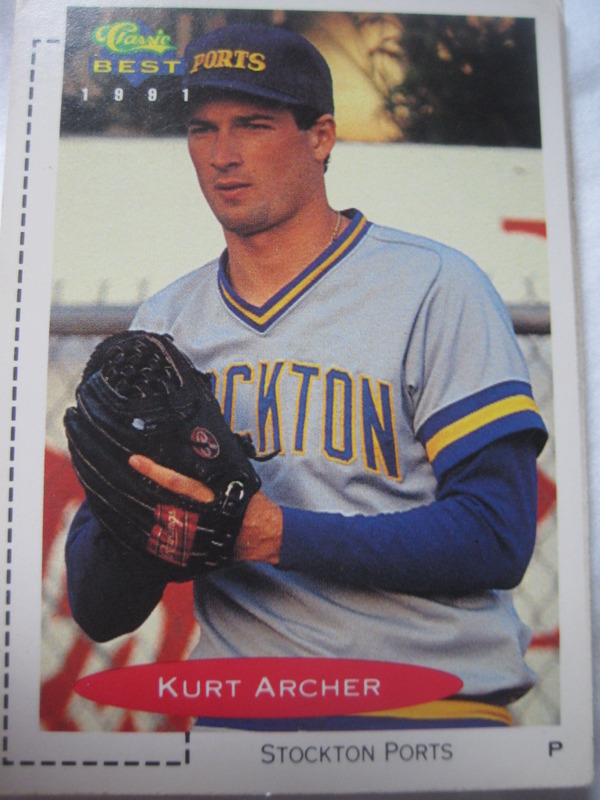 Playing career: Kurt Archer pitched in the Brewers organization from 1990 to 1996, winning 35 games and saving 44. His best season was 1992, when he went 11-3 with 15 saves and a 1.88 ERA for Stockton. Where he is now: He is a sales rep for Western State Design, a commercial laundry equipment distributor. He is also the Minors National Director for the Buchanan Cal Ripken League in Clovis, CA. Google Autocomplete results: He is tenth when you type Kurt Ar, after Kurt Ardaman Attorney, a land use lawyer in Florida. The first two links when you google Kurt Archer are not the ballplayer but a documentary filmmaker. Coming up next: The next profile will be Oswaldo Arcia.